Boys Teams are guaranteed 4 games. Join us for the Annual Eagle River Jam & River Park Grand Opening. Enjoy free rafting with Timberline Tours, Hot Dogs, Lawn Games, Live Music and More! Come on down to the new Eagle River Park dressed to get wet. Rafting is open to everyone who arrives before 12:00 pm on a first come first served basis. Some age restrictions may be applied due to water levels. Eagle | May 29, 2019 | 12:00 a.m.
Larkburger Youth Series racers will start and finish at the pool and ice rink and race a long or a short loop on the Haymaker Trail. Beginner and Junior categories will continue down Pool and Ice Ice to the finish. The course will be marked in its entirety by Monday (5/28) evening for pre-riding. Adult racers can park at the finish at the Pool/Ice Rink parking lots, or at after party location at The Dusty Boot and ride to the start or park near the start at Eagle Valley Middle School. There is NO PARKING ALLOWED in The Bluffs neighborhood. Youth racers should park at the pool/ice rink. To adult start: From I-70, exit at Eagle (147) and head South on Eby Creek Road. Proceed right at the roundabout. Turn left on Capital Street. then left again on 3rd Street. Park in the school parking lots on the left. To get from the parking lot to the Start/Finish by bicycle, ride up 3rd Street, turn left on Mill Road. then right on Bluffs Drive. Turn right at the BLM parking lot and head up Bellyache Road. The Start/Finish is .3 miles up Bellyache Road at the Boneyard trailhead. Adult race starts on Bellyache Road at the Boneyard Trailhead east of the Bluffs Neighborhood. To kids start, finish line for all races and on-site registration/bib pick up: From I-70, exit at Eagle (147) and head South on Eby Creek Rd. Proceed right at Round about. Turn left on Broadway. 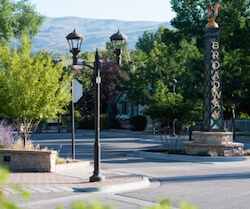 When Broadway deadlends, turn left on 5th Street, then right on Capital St. At the first stop sign, turn left onto Brush Creek Rd. Follow Brush Creek Rd. to the Pool and Ice Rink. On-site registration will be located at the Pool & Ice Rink (race finish) and will end at 5:20 p.m. You will need to ride/drive to the start by 5:45 p.m. so please plan accordingly. 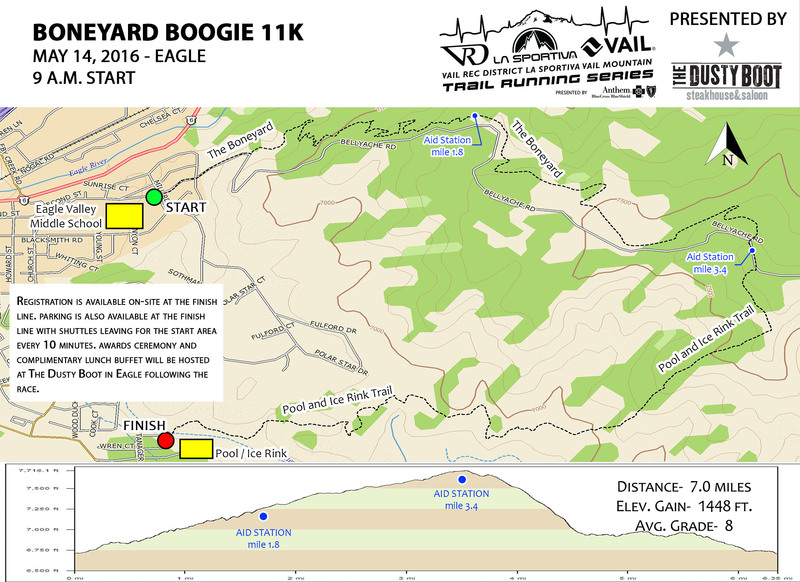 Join us for race results, prizes and beer at The Dusty Boot in Eagle! Join us in Eagle for the unofficial kickoff to summer at the 2018 Eagle Outside Festival. On the weekend of May 31-1 these two events collide to fill the town with music, bikes, river sports, fishing, food and beer. Head to Eagle Ranch to demo the newest and greatest gear from some of the best bike companies in the industry. Test the bikes and gear out on the trails and prepare yourself for the long Eagle riding season. For more information on the Bike events, demos and activities, visit www.eagleoutsidefestival.com. Ride into the afternoon and party into the night… The 2019 Bonfire Blockparty will transform downtown Eagle into a concert and party with 2 nights of live music. The lineup, schedule and more can be found at www.bonfireblockparty.com and tickets are available now!